I Am Number Four begins with the third murder in a string of killings. Why? Well, apparently there are eight Lorien aliens roaming the earth. Aliens running for their lives from beings who seek to exterminate them. But don't worry. Loriens look like humans. They even go to school and get crushes on cute girls like us, too. But for John Smith, (yes, that's really his alias) he is number Four. And since a special charm keeps the Lorien kids from getting killed out of order, he is slated to be next on the killers' list. John spends all of his life running from city to city with his adoptive father, Henry, in order to throw the Magadarians (the enemy aliens) off his trail. Things get complicated when he falls in love with the local photographer and decides to settle down for a bit. The problem? The Magadarians have finally found him. 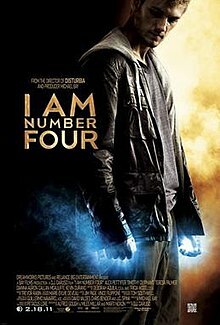 I Am Number Four was made into a feature film that starred Alex Pettyfer and Diana Agron. I saw the movie before I read the book. The book is actually far superior to the movie, which came across as corny to me in some places. Pittacus Lore, an author that cloaks himself in Lemony Snicket-like anonymity, presents a thrilling piece of YA literature. Adventure, romance and science-fiction elements come together to make I Am Number Four a must-read. The book is always so much better. My family hates watching a movie that I have read because I will say things like,"that's now how i pictured her". or "what? ?they cut out that crucial scene!" ..lol.